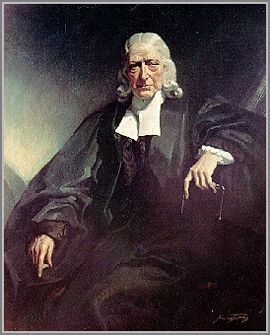 John Wesley, the founder of the Methodist movement, was an Anglican minister in the Church of England. In 1735, John and his brother, Charles Wesley, accompanied James Oglethorpe to the colony of Georgia, where John's attempts to apply his then high-church views aroused hostility. Following this difficult mission trip to America, John returned to England in 1737, discouraged and intending to give up preaching. On the trip home, he was rescued from this discouragement by the influence of the Moravian preacher, Peter Boehler. In 1738, at the age of 34, John Wesley reluctantly attended an evening worship service in London. At this meeting he was deeply moved by a heartwarming experience. In his journal, John Wesley tells of his "Aldersgate Experience." "In the evening I went very unwilling to a society in Aldersgate Street, where one was reading Luther's preface to the Epistle to the Romans. About a quarter before nine, while the leader was describing the change which God works in the heart through faith in Christ, I felt my heart strangely warmed. I felt I did trust in Christ alone for salvation; and an assurance was given me that He had taken away my sins, even mine, and saved me from the law of sin and death." ...from the Journal of John Wesley, May 24, 1738.